Garage: "Garage: 3 Car Attached; Parking Space(s): 6"
Lot Size: 5437sq. 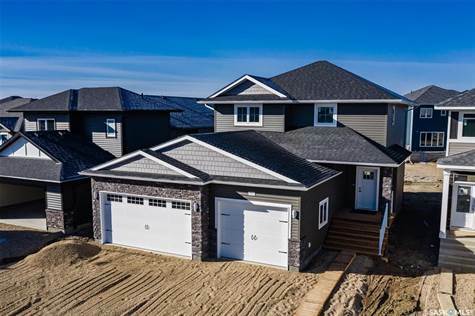 ft. 46ft x 118ft "Rectangular"
Brand new two storey home built by Lexington Homes located in Evergreen. Beautiful 1,814 sq ft home featuring 3 bedrooms, 3 bathrooms plus upstairs bonus room. The kitchen offers quartz countertops, large island & stainless steel appliances. Modern open concept design & finishes are highlighted throughout. Living room features a stunning fireplace focal point with entertainment niche. Large Master bedroom with walk-in closet and three piece ensuite. Two good sized bedrooms, four piece bath and bonus room completes the upstairs layout. Main floor laundry. Basement is ready for development. Triple attached garage, plus a framed in pass-through for overhead door to access the backyard. Close to school, parks and all amenities.